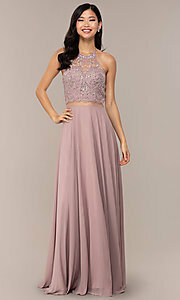 A brilliantly-beaded bodice makes this long chiffon prom dress dazzle for your formal event. Diminishing the need for jewelry, the beaded high neckline connects to solid back straps that frame a tear-drop cut-out detail. Scalloped bead work trims the bodice, as a sheer waist gives this beautiful evening dress a mock two-piece look. With a satin lining, the long a-line skirt of this lovely formal dress gets a full and fabulous style as it flows to the floor. Affordably priced under $200, this long chiffon prom dress is available in misses and plus sizes for a flattering style on the night of your life. The model wearing navy is 5'10" and wearing 3.5" heels.